Fall Specials Email Campaign – David Safanda Design Solutions Inc. The Point Reyes Lodge and Restaurant features 22 rooms and 2 cottages located on three acres, which adjoins the 71,000 acres of the Point Reyes National Seashore Park. 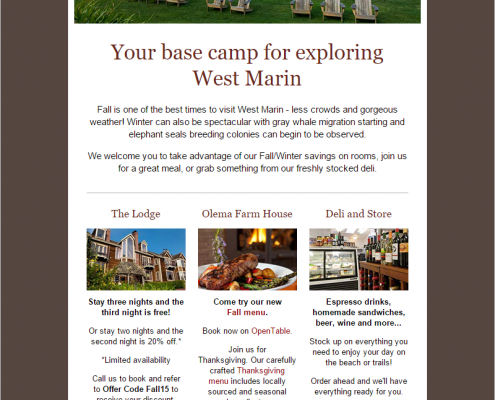 I was tasked with designing and producing a new email campaign promoting seasonal specials. The Point Reyes Lodge and Restaurant features 22 rooms and 2 cottages located on three acres, which adjoins the 71,000 acres of the Point Reyes National Seashore Park and is a short drive from some of the best beaches in Northern California. I was tasked with designing and producing a new email campaign for the Point Reyes Seashore Lodge that promotes seasonal specials. This project involved first developing a series of initial design options. 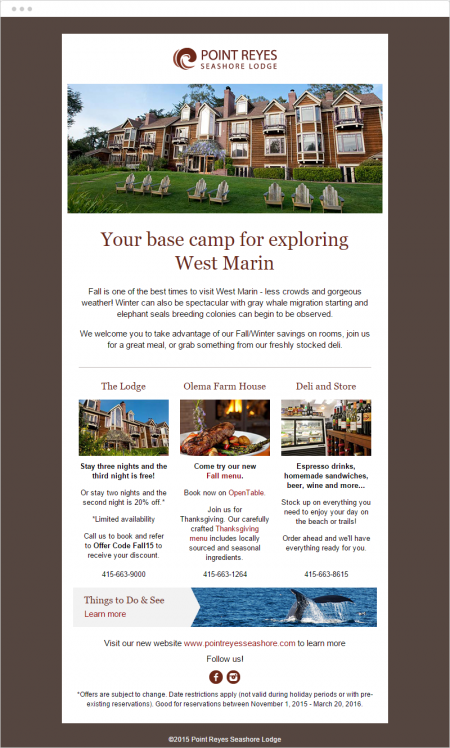 A finalized design incorporating client feedback was produced and then coded as HTML that meets email best practices.